Armenian opposition leader Nikol Pashinyan had a faithful comrade by his side as he marched from Gyumri to capital Yerevan earlier in April. His name is Chalo - a stray dog - who marched with Mr Pashinyan and other protesters for nearly 200 kilometres and 14 days, BBC quotes local media. 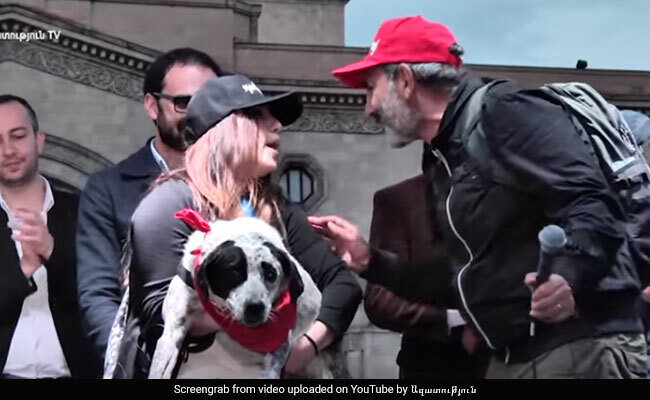 The black and white pooch became an unlikely mascot of the group that was backing Mr Pashinyan to be Armenia's next Prime Minister. When the protesters reached capital city Yereven, Chalo was unfortunately injured in a hit-and-run accident. He was taken care of by the protesters and soon recovered to make an on-stage appearance with Nikol Pashinyan at a rally in the capital's Republic Square, according to Radio Azatutyn. Chalo was brought to the stage carried by a protester. He came wearing a red bandana around his neck and looked rather confused at the adoring crowd. According to BBC, Chalo's appearance made the leader popular on social media as an animal lover. Mr Pashinyan on Tuesday lost the parliamentary vote to become Armenia's Prime Minister. The developments follow months of turmoil in the country following anti-government protests led by Mr Pashinyan.